Posted on October 23, 2014 at 12:26 pm. 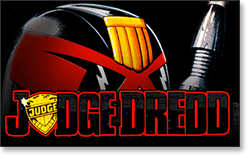 Update (29/10/2014): Judge Dredd is now also live at www.GdayCasino.com. In June 2014, NextGen Gaming announced it had secured the rights to produce a Web pokie based on Judge Dredd, the iconic no-nonsense law enforcer from the 2000 AD comic franchise. This week saw the game’s official launch, and it is now up and running at Guts.com – one of our top online slots casinos for Australian gamblers. Judge Dredd has won a huge cult following since the release of the first 2000 AD comic way back in 1977, spawning numerous video games, RPGs and board games, and live action movies – including the infamous 1995 film starring Sylvester Stallone as the title character. Now we can rejoin Dredd on his bloody quest for law and order and win real cash along the way. Australian developer NextGen – the Sydney-based branch of the NYX Gaming Group – has done its utmost to capture the vintage essence of the Judge Dredd stories while also keeping things modern and relevant. The result is a vivid and engaging virtual pokie with special features aplenty and a unique graphic quality which reminds one of both the comic book series and the old 8-bit video game on Commodore 64. The Judge Dredd real money slot game comes with five reels, 25 fixed paylines, and no less than nine coin denominations, which allows us to bet up to $50 per spin. Most intriguing among the gameplay features on offer is the SuperBet option – an additional wager where the more cash we stake, the more wild symbols we can activate. NextGen’s licensing agreement covers not only online pokies branding, but also the portable gaming arena – so keep an ear out for news of the Judge Dredd mobile slot for iOS, Android, and all other major smartphone and tablet systems.